Live Release of Atlantic salmon is the best practice the Wilson family could have adopted for their sporting camps on the Miramichi River. 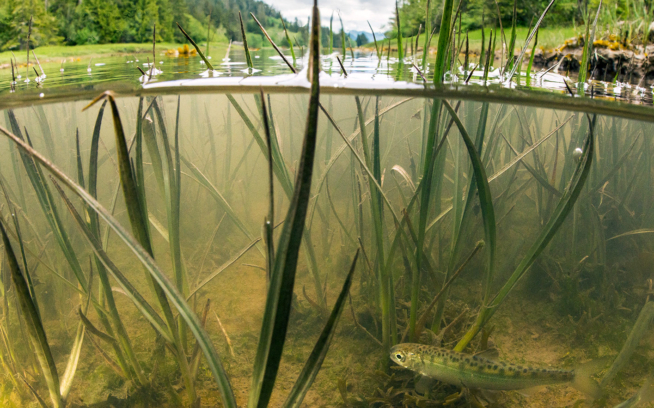 Years of overfishing, dams and habitat destruction all have taken a toll until some years back when ASF and NASF salmon groups came in with plans for passage, buying out commercial nets, etc. After years of hard work, good numbers of fish are once again coming into the system. Pictured here is Bill Taylor, president of the Atlantic Salmon Federation releasing a huge hen salmon that Jake MacDonald hooked, and after a wild twenty minutes managed to land. It began as normal as any other fish until the first jump revealed a monster of a salmon (Jake's first ever). Ten minutes in, Jake announces that he thinks he lost it, and when he tried to reel-up we discovered the line was around a big rock on the far side of the river.